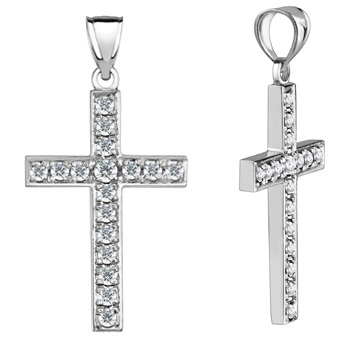 0.90 Carats of quality, white diamonds are set into this 14k solid white gold men's cross pendant. Cross Pendant measures 1 1/4" tall x 1" wide. Pendant weighs approx. 7.5 grams. Also available with blue diamonds or black diamonds, shown below. Choice of White Gold or Yellow Gold. We guarantee our 0.90Carat Men's Diamond Cross Pendant, 14K White Gold to be high quality, authentic jewelry, as described above.